Phew, well, it’s done, the most dreaded recipe in the book. I feel somehow lighter. In 3+ years of cooking through Around my French Table with the French Fridays with Dorie crew, Arman’s Caviar in Aspic has always lurked in the background as the recipe which I was most dreading. So many delicious recipes, so many rewarding recipes, so many wonderful surprises, and now I’ve survived my first foray into aspic! I gave a bit of thought to changing up the flavors of this one a bit. If I’m being honest, it was more than a bit. I actually enjoy caviar on occasion, but I was having a hard time embracing the idea of fish flavored aspic. But in the end I couldn’t come up with any brilliant alternatives and decided that I should just stick it out and try the original and see what happens. Well, not entirely original, because I decided pretty much right off the bat that carving aspic cups was just not going to happen. We all have to know our limitations and my arts and craft skills peaked in kindergarten. 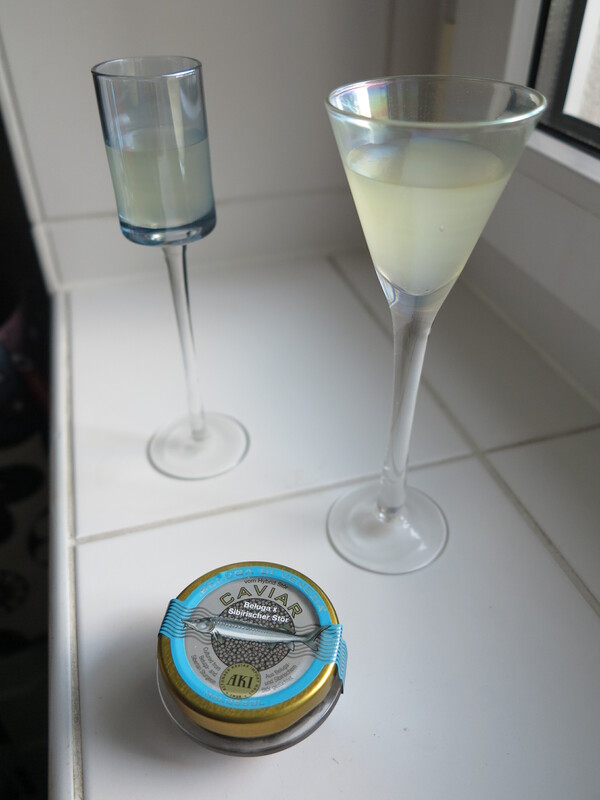 Instead I pulled out some schnapps glasses and decided to serve these in little cups with the caviar sitting on top. What can I say, they were easy, elegant, and I learned something new. But the jelly was too firm and fishy for my tastes and I remain a confirmed aspic skeptic. And heck, if I can survive fishy aspic, I can survive anything! So bring on the raw fish, live lobsters, leftover beef, and whatever the heck escabeche and marengo are. I’m ready! This entry was posted in french fridays with dorie and tagged Around my French Table, finger food, fish, starters. Bookmark the permalink. Nicely done! I’m pretending this week doesn’t exist. Yours look pretty, at least. Yours are so pretty! I do enjoy caviar but couldn’t justify getting any for what would have been two tiny portions (plus I mean, fish jelly? No thanks…). I didn’t make this (but will) but I didn’t rest on my laurels either 😉 Happy New Year! I love your can-do, bring it on attitude for the rest of the recipes in the book. Makes me wish I had played around with this recipe for a bit, or at least with the concept of the gelatin. Your schnapps glasses are very pretty. I wish I could justify buying some. What a lovely presentation! You’re a good sport for giving this one a go! Looks pretty! I logged on after a long break – I’m cheese soufflé-ing for a friend at lunch (one of the most pleasant FFwD memories I have, from 2012!). Not sure I can start back w/aspic – ha! Very pretty presentation and you bought good caviar… not surprised that the fish flavor jelly on it’s own didn’t taste so good. Very well done indeed, Rose! And very brave…much braver than I! I chose a different direction…. I wasn’t going to spend an afternoon preparing these and then have to throw them out! Your presentation is quite lovely, better than carving out little cups! Yeah for you!! I love your idea and presentation. I have mine chilling now. I did a different idea too. Now I just have to break out some champagne later (let’s face it, everything’s better with a glass of bubbles). Yup, this one was challenging – and not in a good way. Kudos to you for making it. Yours looks beautiful! If only it tasted as good as it looks, right? It wasn’t a success for us either and I too figure that the other stuff can’t be as bad! I love your presentation. You are so right that it’s good this one is now in our past. Nothing else left is nearly as scary. 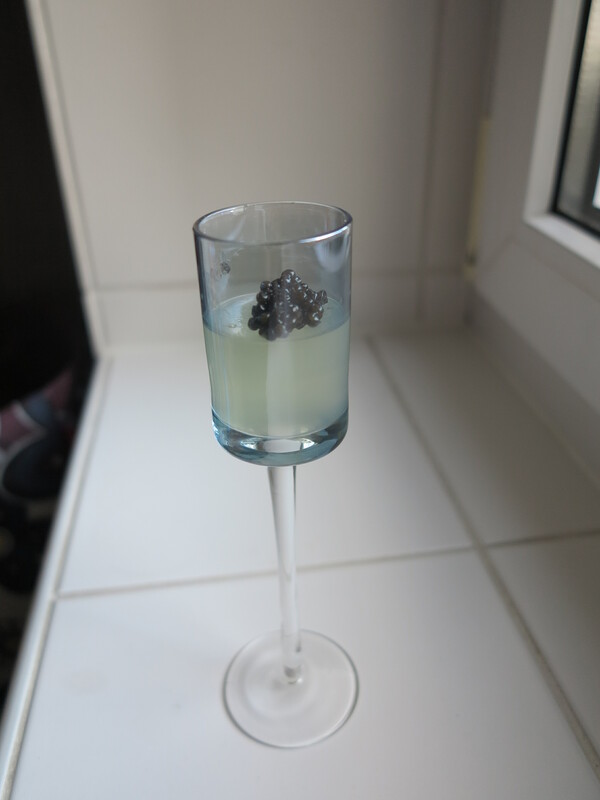 Rose, such a picture perfect presentation with real caviar…I am quite impressed, my dear! Your rendition of Arman’s Caviar in Aspic looks very pretty, Rosa. Although from your very descriptive Post, I know it didn’t taste delicious. Kudos to you for trying. I must admit that as I wade through the negative Posts of many Doristas, I am laughing very hard. Yes, this was a challenging one. Glad I was on my 1,000-mile road trip. Just couldn’t get it done. Went with the Simplest Breton Fish Stew. Like everyone said, you had the best presentation. I did a make up instead. On to next week. I am NOT looking forward to the escabeche. Because…sardines…. Sigh. We did it! Well, I will be doing it this week, but it does feel good to get this one out of the way before the bitter end. I think I will be sticking pretty close to the recipe too, but I don’t have high hopes for it. Fish aspic was something I could not try! Kudos to you!